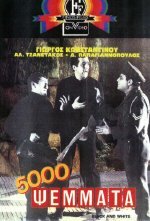 This little-known Greek film, 5000 YEMMATA (5000 Lies) contains one of the earliest Vangelis scores from around 1967! The film was produced by Finos Films, one of the most important Greek film studios. A strange little comedy to be sure. This is available on videocassette from Greece in the PAL format, and was available briefly on video in the USA, courtesy of Greek Video, Records and Tapes in the NTSC format. Both seem awfully difficult to track down. It's strange, I've been collecting a long time and only learned about this video in the past couple of years, even though the tape has been available since 1988. In 2009, Victory Media in Greece has finally released this film on DVD as part of their efforts to bring all the great Finos Films to the public. However, you have to buy a box set to get it! If you don't understand Greek but understand English, this is the version to have for the subtitles! Funny movie. 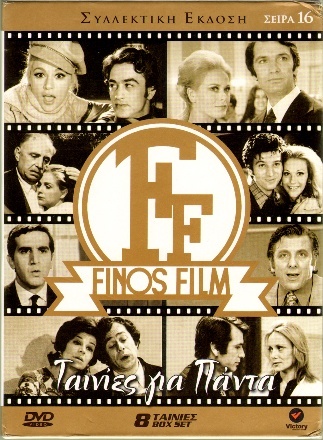 2009, 8 DVD box set entitled Everlasting Films of Finos Films-Series 16, which includes "5000 Lies", PAL, black and white, English subtitles!